Decoying, unlike deflecting, is not trying to lead pieces from certain positions but to lead them to certain squares in order to checkmate or gain material advantage. Black moves 1... Qb1! . This way the white king is forced to capture 2. K:b1. You can see how the king was lead to the b2 square (where he was exposed to checkmate) away from d1 thus making possible for the black rook to move 2... Rd1 checkmate. This next game was played between Holzhausen and Tarrasch at Berlin in 1912. 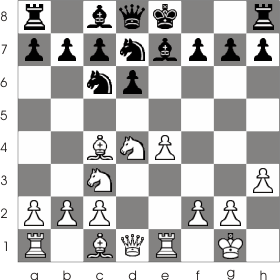 As you can see White developed his position better than Black, his pieces having a greater range of action. Black has his pieces placed in a closed position and with a small range of action. 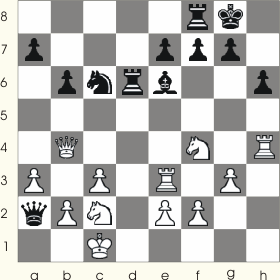 White takes advantage of this and of the weakness from f7 and makes a beautiful combination of moves. 1. B:f7+ K:f7 2. Ne6 K:e6 (This last move is forced otherwise Black lose his queen) 3. Q:d5+ Kf6 4.Qf5 .